A neutron star, located 40,000 light years away, is generating the most intense magnetic field yet observed in the Universe at over 1 x 1014 Gauss! In contrast, the Earth's magnetic field varies from .25 to .65 Gauss, making the field strength of a so-called "magnetar" one thousand trillion times stronger. "The magnetic field generated by this star is truly incredible," Kouveliotou said, "It is so intense that it heats the surface to 18 million degrees Fahrenheit." This discovery was made with data from RXTE and ASCA (the Japanese-American Advanced Satellite for Cosmology and Astrophysics) combined by Dr. Chryssa Kouveliotou of Marshall Space Flight Center, Dr. Stefan Dieters and Professor Jan van Paradijs of the University of Alabama in Huntsville, and Dr. Tod Strohmayer of Goddard Space Flight Center. In November 1996, the Burst and Transient Source Experiment aboard the Compton Gamma Ray Observatory detected the magnetar flaring up and emitting gamma-rays. Kouveliotou used time she was allotted on Rossi X-ray Timing Explorer to take a closer look in the X-ray at the behavior that followed. During Nov. 5-18, 1996, RXTE collected several hours worth of data as bursts came in a "bunching" mode that had not been seen before. Following Kouveliotou's observations, RXTE kept watching to provide data for Strohmayer who was allotted time to observe the source during its less active phase. The result was a complementary data set that led to collaboration. "Combining our data gave us both the capability to make a more sensitive search as well as provide a way to verify each other's analysis of the data," said Strohmayer. They also looked through older data taken by ASCA in 1993 when the source was not bursting. Along with the observation of a changing pulse period, the ASCA data was central in establishing that this source was associated with a supernova remnant. 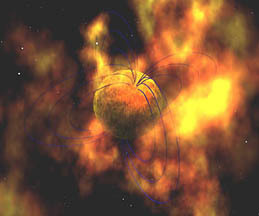 Their finding confirms the existence of the magnetar as a class of neutron stars. Neutron stars themselves, the tightly-packed neutron cores of exploded stars, have very strong magnetic fields but a magnetar has fields 100 times stronger. "The magnetic field generated by this star is truly incredible," Kouveliotou said, "It is so intense that it heats the surface to 18 million degrees Fahrenheit. Periodically, the field drifts through the crust of the neutron star, exerting such colossal forces that it causes a "starquake." The "starquake" energy is then released as an intense burst of low-energy gamma-rays." Objects that emit these bursts of gamma-rays are called Soft Gamma Repeaters. When they burst, they can give off as much energy in a second as the Sun does in an entire year! The magnetar RXTE observed, also known as SGR 1802-20 (SGR being short for Soft Gamma Repeater), was first discovered because it gives off soft gamma-ray bursts. The very first Soft Gamma Repeater was observed in 1979. Their origin has been debated ever since. With this discovery by Kouveliotou's team, researchers have come to believe that the origin of Soft Gamma Repeaters does indeed lie in the 'starquake' phenomena of magnetars. The magnetar theory was first proposed in 1992 by astrophysicists Dr. Robert Duncan of the University of Texas at Austin and Dr. Christopher Thompson of the University of North Carolina at Chapel Hill. How many neutrons stars fall into this special class? Astronomers believe that at least 10 percent of neutron stars are born with magnetic fields that are strong enough to be considered magnetars. Neutron stars with such superstrong magnetic fields 'brake' or 'cool down' over time, in fact SGR 1806-20, which is observed to be spinning once every 7.5 seconds actually slows down 3 milliseconds every year. "We found that the pulsar was slowing down at a rate that suggested a magnetic field strength of about 800 trillion Gauss, a field strength similar to that for so called magnetars predicted by previous theoretical work," said Kouveliotou. Because of the high field strength, it is very difficult to observe stars like this in radio waves or X-rays. This means there could be thousands or millions of these stars scattered throughout our Galaxy, perhaps even accounting for the large number of observed supernova remnants without detectable neutron stars at their centers. Kouveliotou says, "The importance of this discovery goes beyond just adding a new oddity to the list of star types. It ties together two rare, very peculiar classes of stars we have been puzzling over, and puts the evolution of neutron stars and even galaxies in a new light." 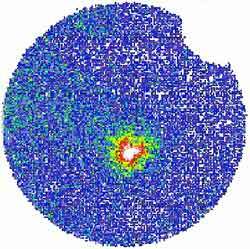 She added, "This finding should help us better calculate the rate at which stars die and create the heavier elements that later become planets and other stars."